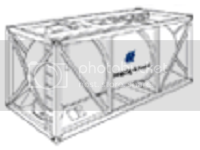 An intermodal container (also known as freight container, ISO container, shipping container) is a standardized reusable steel box used to store and move materials and products efficiently and securely in the global containerized intermodal freight transport system. Intermodal indicates that the container can be used across various modes of transport (from ship to rail to truck) without unloading and reloading its contents. Lengths of containers vary from 8 to 56 feet and heights from 8 to 9.5 feet. The standard ones are typically 20, 40 and 45 feet in length and height of 8.5 feet or 9.5 feet (called high-cube). Please note that each shipping line has its own container dimensions and the table below is a general guideline shown only for academic purposes. The dimensions will not greatly vary from what is shown here but for specific requirements relating to a shipping line, please check the actual dimensions with that shipping line.